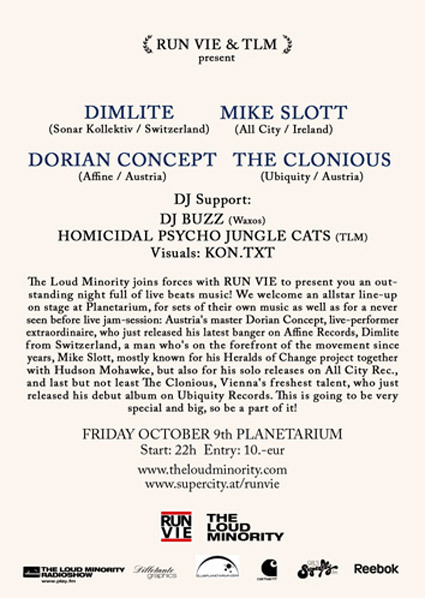 The line up involves concerts from Dorian Concept, Austria’s new super producer for edgy electronic sounds, Dimlite from Switzerland, Mike Slott from New York and The Clonious from Vienna. Their electronic machines will be mixed together far beyond any rules and limits in order to reach a psychedelic sound space that is simultaneously rooted in Hip Hop and Glitch. The show will be supported by DJ Buzz from the famous Waxolutionists Hip Hop crew. All in all a line-up that promises a night of sound beyond any standards. The right place for people who like to move and groove against the mass.